“Why would anyone be nostalgic for unhappiness?” The teenage Art Dennison wonders this while contemplating his less than ideal childhood, and while realizing he actually misses it. 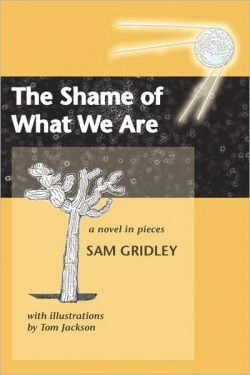 Art, the main character of Sam Gridley’s novel, The Shame of What We Are, is five years old and living in 1950s New Jersey when the book begins, a child desperate to escape his parents’ constant fighting. For the next thirteen years, he is ping-ponged from coast to coast and house to house, losing himself in science fiction and his own peculiar imagination. Detachment will be Art’s defense mechanism throughout his young life. Gridley is a former Stegner Fellow at Stanford, and his stories have been published in several journals. But The Shame of What We Are is his first printed novel—or rather, “a novel in pieces,” and this fragmentary storytelling rides in perfect pitch with the disjointed life its protagonist leads. After trying, but failing, to block out yet another parental spat, Art takes a more extreme approach that goes beyond a need to merely disassociate: “He squished his forehead into the plaster until the pain grew strong enough to balance the electric zaps of understanding.” Art refuses to make sense of the anger around him, then yearns to remain wholly separate from it. But this desire for isolation will have its own ill effects. Like many young people, Art feels as though he is drifting without a solid place to land, a sensation which is only exacerbated by his tumultuous home life. But when he visits relatives, he glimpses a different, more stable kind of family. Alone at night, he presses a hand to the window, “but the glass pane was chilly to the touch, a reminder that he might always be separated from the genuine world even when he was on the inside.” Art has convinced himself he is different, and wonders if it is even possible for him to belong. Filled with a self-deprecating humor, and stark, if not painful, insights into how one survives in a precarious environment, this novel slices open the veins of a confused boy and allows the reader to walk a decade inside his skin. Though at times it is uncomfortable, one cannot turn too long from the truths unfolding in these pages, and when the grown-up Art declares, “I may belong in another universe, but I do want to be human, I do, I do,” one recognizes this decision as the step forward every person must take to find his place, and his peace, in this volatile world.